This piece of work was done in Sec 2, for our AEP SIA(we are supposed to hold an art exhibition as a group). Well, this is my favourite piece among my other works that are for the exhibition. 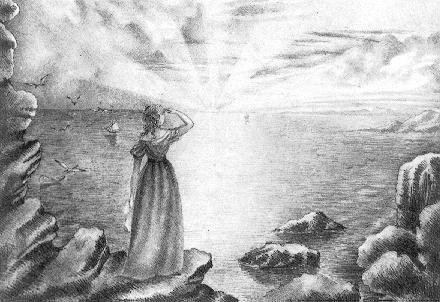 The artwork depicts a view of the sun rising over the horizon at a serene beach, with a girl at the right side of the picture. I like this artwork as it carries a deep meaning to it--- it symbolizes hope. The dawn of a new day suggests a new beginning, which means that hope is arriving. Light is often associated with hope and happiness, unlike darkness, which is often associated with depression and sadness. The girl, with her back facing the viewer, may be wishing as her hands are in front of her, hoping to have a bright future ahead, or hoping that she will be able to overcome her problems as a new day arrives. However, I still think that I still need to practise more on bringing out the details. Even though the the sea is created using short and choppy strokes, I could have drawn out the waves in a more significant manner so as to show the difference between the sky and the sea. I could also have worked on bringing out the different foldings of the girl's dress to bring out the fact that the sea breeze is blowing at her. I wished that I had drawn this work in colour pencils as the beauty of a sunrise would be best expressed by colours. Well, the composition and the way of depicting the sun rays of my work are similar to this work. Compared to the original work, I think that mine has lots of room for improvement, for example, I could have worked on the shadings more so as to bring out more contrast and dynamism in my work. In the original work, the beauty of the sunrays is captured when the clouds are present(as it looked like the sun rays are shining through the clouds). So I should have added more details to the surrounding scenery so that my work will look more interesting. Our Sec 3 AEP SIA!